Definition at line 82 of file internal-transport.hpp. The connected forwarder-side transport will be disconnected automatically if this method is called again, or if that transport is closed. It's safe to use InternalClientTransport without a connected forwarder-side transport: all sent packets would be lost, and nothing would be received. Definition at line 83 of file internal-transport.cpp. 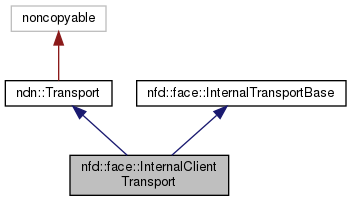 References nfd::face::InternalTransportBase::afterSend, nfd::face::Transport::afterStateChange, nfd::face::asyncReceive(), nfd::face::CLOSED, ndn::util::signal::ScopedConnection::disconnect(), and NFD_LOG_DEBUG. Definition at line 104 of file internal-transport.cpp. Definition at line 100 of file internal-transport.hpp. This operation has no effect if transport has been paused, or when connection is being established. Definition at line 105 of file internal-transport.hpp. This operation has no effect if transport is not paused, or when connection is being established. Definition at line 110 of file internal-transport.hpp. Definition at line 112 of file internal-transport.cpp. Scatter/gather API is utilized to send two non-consecutive memory blocks together (as part of the same message in datagram-oriented transports). Definition at line 118 of file internal-transport.cpp. References ndn::encoding::Encoder::appendByteArray(), send(), ndn::Block::size(), and ndn::Block::wire().